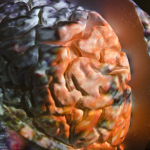 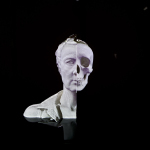 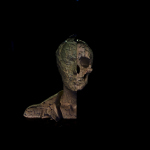 This is a sculpture with projected video developed from the 3D printed life-sized bust, Neuro Memento Mori. 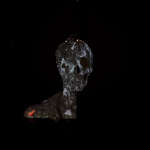 The work was shown for the first time at SIGGRAPH Asia in Kobe, Japan 2015, then in 2016 in ALTER: Between Human and Non-Human at Gus Fischer Gallery, New Zealand and at ISEA2016 in Hong Kong. 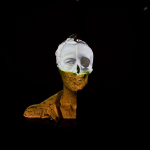 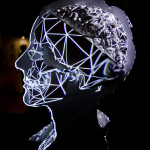 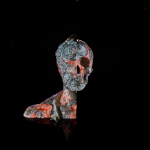 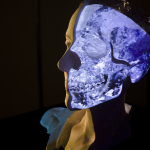 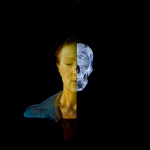 Video projection mapped onto a life-sized 3D printed self-portrait sculptures produced by combining 3D facial scanning with fMRI brain data that is gathered during novel MRI experiments, designed in collaboration with two neuroscientists, during which the artist views memento mori paintings and meditates on death in the scanner.